Huge sense of relief when my first slide appeared on the screen in the University’s swanky newsroom. Even more relieved when my audio clips boomed round the room. It’s a really big room to teach in with fantastic equipment but not ideal for lecturing because half the class have their back to you. The rest are hidden behind 2 big computer screens. I got it sorted by the afternoon lecture and got them all to huddle round the front rows whilst I was talking and then go back to their screens for the writing exercises. It was really good fun meeting the first years and working with them. I’m struggling to remember names though. 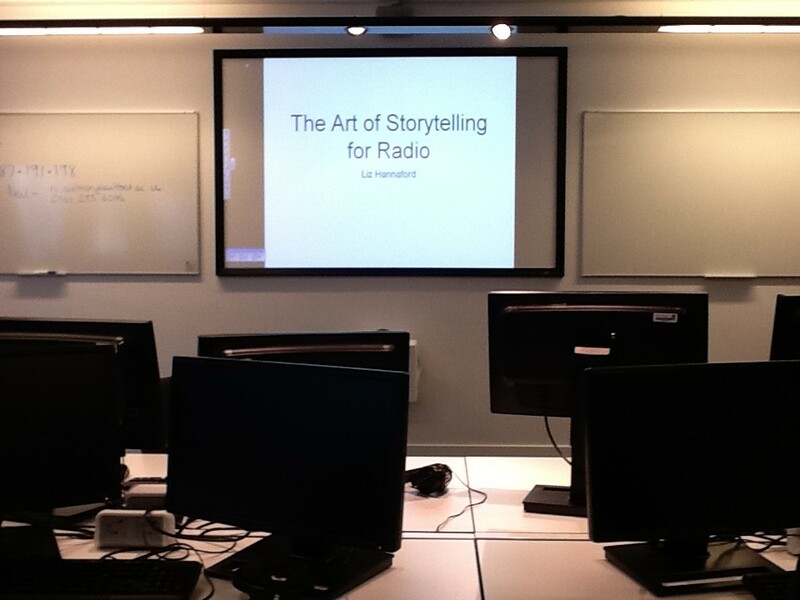 The aim of the first lecture was just to think about how we tell stories on the radio. So we looked at why radio newsreaders don’t just read out stories from newspapers – they’re too long and too dense for the ear to take in. After lots of talking from me and listening to examples, I got them to have a go at putting it into practice. They looked at an online story about proposed changes to constituency boundaries which could see Salford Quays becoming part of Manchester Central. I thought it was great that the students were so willing to read out their work to share it with the class for discussion. There were some really good efforts and a couple of quirky ways of dealing with the material which hadn’t even occurred to me. Great! I really enjoyed it but, honestly, delivering 2 lectures of 3 hours each is exhausting…. This entry was posted in Uncategorized on October 9, 2011 by LizHannaford.